What do we believe? And in God's name why? Lewis Black has the answers. Or at least his answers. He survived Hebrew school and a bar mitzvah (barely), was a 60's college student who saw the parallels between religious rapture and drug-induced visions (even if none of his friends did), explored the self-actualization movement of the 70's (and the self-indulgence it engendered), and turned a cynical eye toward politicians who don the cloak of religious rectitude to cover up their own hypocrisy. What he learned about the inconsistencies and peculiarities of religion infuriated Black, and in Me of Little Faith they get his full comic attention. In a series of comedic inquiries, Black explores how the rules and constraints of religion have affected his life and the lives of us all. Hilarious experiences with rabbis, Mormons, gurus, psychics, and even the joy of a perfect round of golf give Black the chance to expound upon what we believe and why - in the language of a shock jock and with the heart of an iconoclast. Ok, he is not the traditional religious writer, but he usually makes sense. I had the feeling he truely tried to respect the religious opinions of others, but was not drawn into their madness. Who would have thought that this man, this potty mouth man, could so articulate such a complex subject and still make me laugh. Well worth the time and money for this book. It was like being at a Louis Black concert! An unadulterated deliniation of the humor found in religions across the globe. From the radical to the ridiculous, you'll hear about some points you knew and several you probably didn't about the faith of the country and the world. If you can't both take your faith seriously AND take a joke - this probably isn't for you. But if you can, you'll laugh yourself silly. Hearing him is the difference. Would you listen to Me of Little Faith again? Why? I have read the paperback book twice. I have listened to the audibile three times. Hearing him vocalize the exclamation makes all the difference. What was one of the most memorable moments of Me of Little Faith? 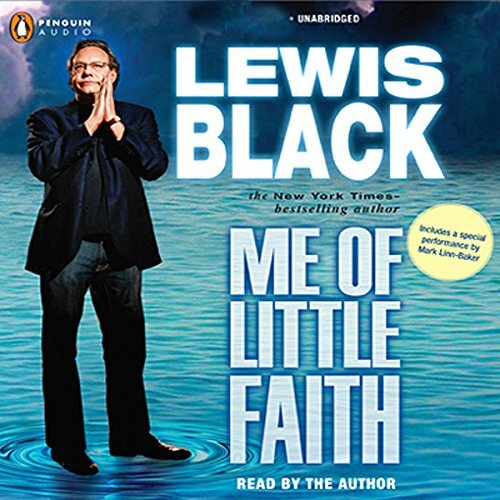 Have you listened to any of Lewis Black’s other performances before? How does this one compare? I have seen his live show twice. While the audibile gives you the voice of this comical genius I would still have to say seeing him live is better. As an Atheist I love to read books that challenge religions. Lewis is not an out right Atheist, yet he does challenge all religions. Great work. Great sound. Great overall content. Black's customary energy and anger come through. He has moments in which he displays some of the angry humor that is so effective politically. But, ultimately, he's a man of more than a little faith. Like Mulder on the X-Files, he -wants- to believe, and he's coming up with justifications. Gullible ones. Really, if Lewis Black were reviewing his own book, he'd savage himself, particularly on the astrology and psychic sections. On the other hand, there are genuine moments of hilarity and insight in here. As a skeptic/non-believer who usually likes Black, I was disappointed - not because I disagreed with him, but because he just couldn't maintain any intellectual consistency. I'd expect more from him. But there were moments of entertainment, and I've had worse 5 hour blocks of my life while driving in the winter. Just OK...and I love Lewis Black! Typical LB...but just not the same not actually SEEING him perform it. Still, funny and worth it...just not something to put at the top of your list. Sounds cobbled together from his standup. Could have been better organized. Last part just filler to take up time. let me say up front that I am a big Lewis Black fan. He is my favorite comedian. if you can laugh at religion, than you will probably enjoy this book. if you take religion seriously or are easily offended, I would recommend you skip it. The subject is the same for almost 6 hours. I was a bit disappointed with this piece. The book wasn't exactly bad, but as a fan of Lewis Black's comedy specials involving him getting worked up and ranting about observations of stupidity. This is actually a calm and rational narrative of Black's experiences with religion and the supernatural. It has a couple bits of sarcastic humor, but the most part I would argue that this book should be moved from comedy to the nonfiction section.